Just because a company isn’t a huge enterprise doesn’t mean it doesn’t have big IT management headaches. That’s the problem SaaS startup Panorama9 seeks to solve with its eponymous web dashboard. The Copenhagen-based company launched in 2010 and is rolling out the service — which has been available in Europe — in the U.S. on Tuesday. The target companies may be small, but the problem — and opportunity — is big, Panorama9 CEO Allan Thorvaldsen said in an interview a few months ago. Offerings from other companies including Solarwinds, GFI Software, and Kaseya are also attacking this problem. Many companies use tools from Symantec(s symc), McAfee(s intc), Microsoft(s msft) to monitor parts of their IT. Panorama9, he said, can tap into all these sources using an agent that runs on site, but the rest of the technology deploys from the cloud. According to the company, the U.S. release adds new patch management that consolidates and simplifies deployment of updates across devices, applications and operating systems, flagging PCs and servers that lack important Microsoft patches or are running old versions of Mozilla, Adobe Flash (s adbe) or Sun’s Java runtime. Thorvaldsen said set up is easy — deploying the on-premises agent takes five minutes. 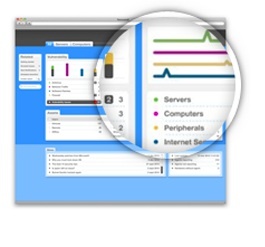 From there, Panorama9’s SaaS service aggregates and displays the company’s IT usage information in a single dashboard. Prospective customers can kick the tires for free for 30 days. Then subscription pricing starts at $99 per month. Panorama9 is Thorvaldsen’s third startup. The first was SoftCom Solutions, a managed service provider; the second was SoftScan which offered a hosted anti-spam service and sold to Symantec in 2009. What Panorama9 promises — a one-stop shop for managing all a small business’s IT whether it’s running in house or in the cloud — is indeed a tall order. If all that works as advertised, it is a big deal.